The Paoloni range of sanding machines is engineered to a very high standard and incorporate design details which make the machines a pleasure to use on a daily basis. The machine frame is fabricated on a monobloc ribbed steel frame to produce a structure that is strong and vibration free, essential to produce high quality panels. 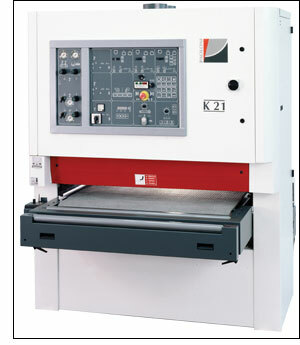 A working width of 1100mm is ideal for most applications. Panels are transported on a rubber carpet which has a pneumatic device for automatic centering. The table is raised and lowered on four lifting screws with a chain drive to ensure perfect parallel motion. Limit switches at each end of the stroke prevent the sanding belt coming into contact with the conveyor and give a minimum working height of 3mm with a maximum working height of 200mm. 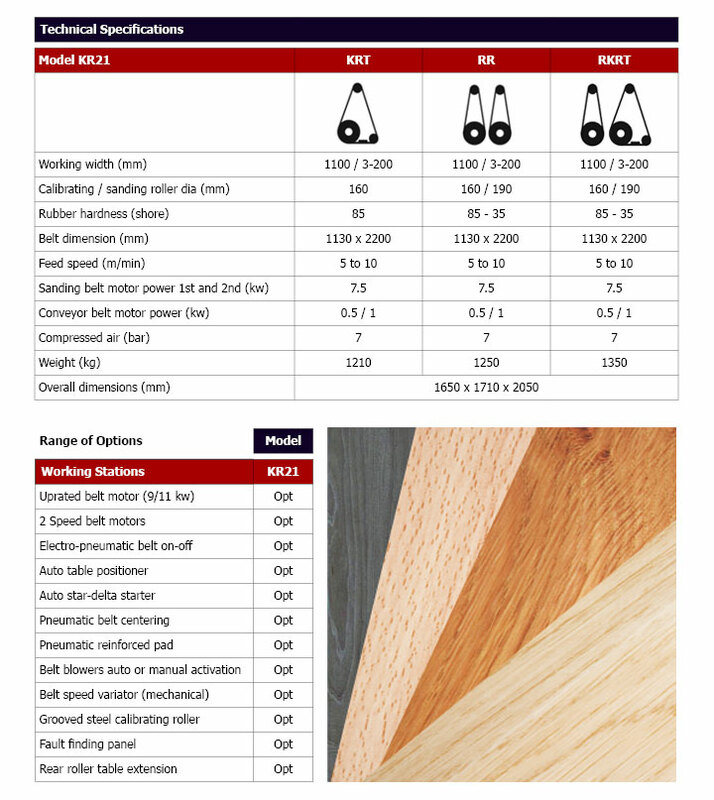 Panel thickness is set with an automatic measuring device, which has the added facility of lowering the table prior to setting and prevents the accidental sanding through on panels that have not been calibrated prior to veneering. An adjuster also allows the operator to pre-determine the amount of material to be removed on each pass. The is automatically tracked by an electronic sensor which saves on air consumption and in the event of a belt breaking the machine will automatically stop. A front limit switch prevents the feeding of oversized panels and protects the sanding heads. The sanding head has a 140mm steel roller for calibration of panels and joinery components and a rigid pad for finish sanding of solid components or veneers. The minimum working length is 380mm. The sanding units have an adjustment to compensate for varying belt thicknesses. The extraction is designed to wrap around the sanding drum and maximise the efficiency of the exhaust whilst minimising the noise generated.